Sometimes teachers ask why I accept friend requests from my students’ parents on Facebook. The simple fact is that I feel like I learn so much more about my students through their parents. This deepens our bond during the school year, and beyond. Students “leave” my class at the end of fifth grade, but not really. I am blessed to see them in the community, to be part of their lives for many years. Facebook allows me to peek in on a regular basis, keep up to date. Most days it makes me simply smile to see these beautiful kids as they grow. Sometimes my heart is tugged so much, I must write about it. Such was the case tonight. Delaney was in my class last year. She is a wonderful kid. A caring friend. She knows her mind, knows her values, and stands for what she believes in. Delaney taught me a lot last year. One thing she really reinforced for me was the power of connections between humans and animals. Last year was the year of animals. Joey wrote a poem when he lost his goat and it made me cry. (HERE) We lost our dog and I struggled to say good-bye. (HERE) Delaney and her mom raised some puppies and she wrote poems to the new owners as she sent them on their way. With each lesson last year, I was reminded of the loyalty of animals and the power of our love for them. It was an important reminder. Reading and writing are an important part of my life, which would come as no surprise to anyone. However, nothing trumps connections for me. I love building relationships with my students each year. Watching those relationships grow. How the simple belief in my students can nourish them, allow them to find the confidence in who they are meant to me. It is a gift that I am allowed to do this each year. It is a gift that I get paid to sit back and watch kids grow, it is magical. Some kids need me more than others. For others, I am just a spectator; they already have what they need. Delaney has it. I was privileged to watch her last year. I get to still have a ringside seat this year through Facebook. 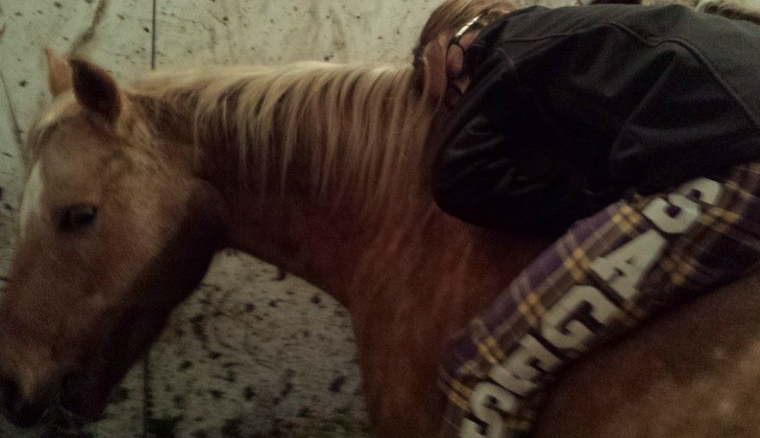 Her mom posted these photos tonight and gave me permission to write about them, to share them. 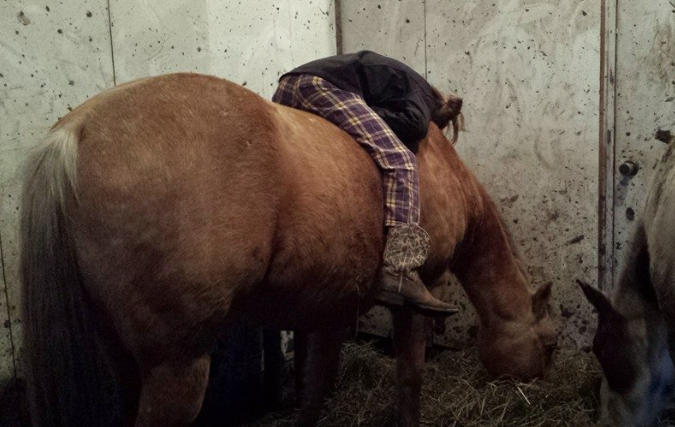 Yes, that would be Delaney, asleep on her horse. Her mom said that he kept picking his head up, checking on her, making sure she is still there, still ok. Watching Delaney and her horse, Denver, I wish to my very core that I wrote children’s books. Their relationship is one that should be found on the pages of a beloved novel or picture book. It is pure and beautiful to behold. Connections. Knowing what you are meant to do. Relationships. Love for animals. I love this world and getting to be a small part of so many kids lives. It is what makes it all worth it. I went to the doctor on Monday night. I've been battling this cold/cough combo of fun for two weeks and just wanted to ensure it was nothing more. My fabulous doc suggested cough syrup with codeine and a day of vocal rest on Tuesday. I laughed and reminded her I needed to teach. She suggested letting the kids read on their own. When I explained that I was beginning the day reading a picture book to 78 children in my room, she looked at me with a skeptical glance. A picture book? Don't you still teach fifth graders? Aren't they too old for picture books? If my students had been there, the gasp from the audience would have been audible. If my students had been there, they would have taken a collective step back. Instead, I took a breath (and had a few coughs) and went on to explain why a picture book is the perfect text for people of any age. I went on to explain how much you can learn from picture books. I could see that she (and her med student) were still skeptical, so I shared the book I was planning to read to my students on Tuesday. 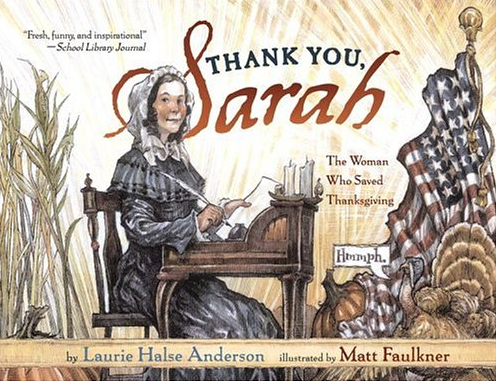 I first read Thank You, Sarah (written by Laurie Halse Anderson, illustrated by Matt Faulkner) about four years ago. I was aghast to find that this was an entire story I did not know about my favorite holiday. If you haven't read it, this is the story of Sarah Hale. She was an amazing woman in the middle to late 1800s. A magazine editor, poet, activist. She wrote Mary Had a Little Lamb, raised several children, wrote stories. She also recognized the importance of a simple holiday where we gather together to give thanks. And so began her campaign to get Thanksgiving as a national holiday. I admire her persistence. She wrote letters to presidents for thirty-eight years. Thirty-eight years. There was a time that I was thirty-eight years old when I was reading this aloud. I remember pondering that fact with my students. That she would have been writing those letters for my entire life so far. Wow. Such determination. So impressive. I love that she changes the world with her mighty sword, a pen. Such a powerful message for my young friends to see. No way! Nothing stopped Sarah! Every year I read that. Every year I pause, look at the kids, and reread it. Such wisdom in so few words. Thank You, Sarah is simply the perfect book. It educates the students on an important part of the history. The writing is sublime. The illustrations, fascinating. I could study each one - so many metaphors contained in these beautiful drawings - for hours. After professing my love for this book, sharing the message, my doctor and the med student looked at me in a bit of awe. My doc, such a wise woman herself, slowly nodded her head and said maybe she hadn't realized the power of picture books. She also thanked me for the lesson on Sarah Hale and wrote down the title to purchase herself. A prescription for cough syrup with codeine and a converted picture book enthusiast? A perfect visit indeed. NCTE. Every year that I come home from it, I kick myself for all of the years I didn't attend. So many amazing sessions, so many wonderful friends, and such a fabulous focus on literacy. It is a conference I look forward to all year long. This year was no exception. I shared the Animoto video I created last year with my students before I left. I felt that it was important to show them what I was doing and why I would be leaving them for three days. They loved the video and asked me to get photos with as many authors as possible. One awesome kid said, "If you hug them, it will be like we did too." Love these kids of mine. So, I went. I learned, marinating in the amazing ideas and ideals. To be surrounded with people - so many people - that have such passion for their jobs is rejuvenating. Even while sick, and I'm always sick for NCTE, I was filled with energy. I'm grateful to have had this experience once again. I'm grateful to so many friends for making my trip more memorable than ever. And I'm grateful for cough syrup with codeine, which made last night an amazing night of sleep for the first time in a long time. YAY! I shared this video with my students yesterday. 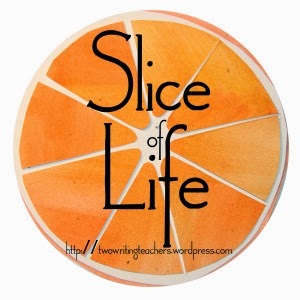 My slice of NCTE. During my career as a student, there was one topic that was sure to elicit a groan in my mind - anytime grammar was the focus of the day. Diagraming sentences? Parts of speech? Punctuation? I tuned out. I tried, I really did, but I just couldn’t remember all of the rules. And unfortunately, to me, grammar was tied to writing. Since I didn’t see myself as a strong student in grammar, I wasn’t a writer as well. This held true for many years, from childhood into adulthood. 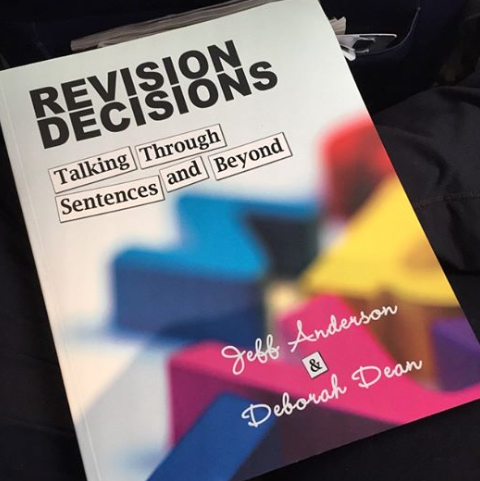 It wasn’t until my thirties, when I began to finally discover my love of writing, that I also began to understand some – just some – of the grammar rules that had eluded me for so long. Jeff Anderson plays a large part in this transformation, thought he is unaware of his role. I saw Jeff speak for the first time about three years ago and was immediately on board. Whatever he was writing, I wanted to buy it. His energy and enthusiasm for the subject of grammar was catching. Grammar, fun? Yes, in Jeff’s world, an enthusiastic yes. This will help my young writers as they try to make sense of the stories they have been writing for the past month. Jeff and Deborah have so many great lessons and insights, I think this is a book you just cannot miss. It is recommended for grades 4-10, but truly, there are nuggets of information to steal for grades below and above that range. Thanks, Jeff, for making me love grammar once again! Each year I have students who enter our classroom and profess loudly that they don’t love reading. Some whisper it. Some don’t say it out loud, but the feelings are still there. They struggle to connect to books. They have no real issues with the act of reading, but have yet to find the joy in it. They see reading as a chore, one more thing they have to do during this game we call school until they can take a break when summer begins. That is where my work begins. I work to get to know the kids, to know the books. I become a matchmaker, trying to find the perfect book that will hook them, draw them in, and teach them the magic that is a good book. It is a process that is quick at times, laborious as others. There are still kids who leave my room and I know, they haven’t found the book – the book – yet. I have to hope they will in the future. I’m a firm believer that there is a right book out there for every person and, conversely, that not every book is right for every kid. I have to remind my students of that each year. When I have recommended a favorite title to them and they quietly return in without comment. I ask, what did they think? Sheepishly, they admit they didn’t love it. We talk about that, how it is perfectly ok not to love all of the books that I do. But, sometimes they do. Sometimes you get to witness magic. It is made up of two simple elements – a child and a book – yet you know when you see them that something has changed. This was the case with a student in my class this week. She wants so badly to love reading, yet hadn’t found that book. I handed off Kate Messner’s upcoming book, All the Answers, and suggested it. I mentioned that there weren’t many kids that had read it yet; this was the only advanced copy I had. She went off and read. She read, and she read, and she read. It was longer than any book she’d tried so far this year. Each time I checked in, she whispered that it was good, and then would duck her head and go back to reading. And then, the magic. Early this week I received a message from her mom. She was finishing the book that night, long after when her “20 minutes” were up. She was still reading. And crying. And reading. And crying. She told her mom she loved this book. Her mom messaged me. My heart soared. The next day she came into class. Quietly she came up to me and whispered that she finished. I looked her in the eyes and asked what she thought. It was beautiful was her reply. What should I read next? I sent her off with another stack of books. She emerged with Sharon Draper’s Out of My Mind and told me she was going to read it, then See You at Harry’s up next and Bigger Than a Breadbox after that. Making reading plans? Recommending a book to her classmates? I was beyond thrilled. This is why we need to know our kids. We need to read books, have them in our classrooms, and be able to match kids to book. It is a lot of work at times. We have to try again and again with some kids. But when it finally takes? It is an amazing sight to behold. And, just a side note, Kate’s book All the Answers? Yes, it is that good. Look for it January 27th. As I mentioned a few posts back, I am in the middle of a Mock Caldecott unit. Margie Myers-Culver and I selected 25 books. For the next 25 days, I share a book a day with my students. We discuss the story elements, illustrations, and critique it. The students record their thoughts in their own notes and on a Padlet. It has been a fabulous first week and I know it will be an enjoyable unit. When Margie and I pick books, there are some she suggests and some I suggest. Two of our last entries were Draw and The Baby Tree. Both were on the New York Times Best 10 Best Illustrated list. When the list came out, I realized we had zero of the books on our list. After reading Travis Jonker’s post (HERE), I asked Margie what she thought about Draw and The Baby Tree, both of which Travis mentioned as the most likely to nab a Caldecott from the list. Margie said both were beautiful, so they were added to our list. "They begin with a seed from their dad which gets planted in an egg inside their mom." My mind reeled with what the reaction could possibly be from fifth graders. If I were teaching kindergarten, this would be a no brainer. It would be enough to possibly make some students want to start a conversation with their family, but wouldn’t be a big deal. Hmm. I debated. I thought of skipping the book. I thought of skipping that page. But then, I paused. I have students reading The Hunger Games. If they can read about kids killing kids, but this would be upsetting, then we have bigger problems. So, I shared it today. I began with the book trailer. I told the kids to think back to when they were in kindergarten. We talked about what five year olds are like. I shared my experiences teaching them. And then, I shared the book. You know what? They rocked. The book rocked. They giggled; they cried out for the glorious thing we call rest time (the boy has rest time on a page in the book), they reminisced. It was magical. They recorded their thoughts on the Padlet below. It could have been embarrassing. It could have been awkward. It could have led down a path that I didn’t want to go. It showed me once again what an awesome group these kids are. How insightful, curious, and passionate they are about learning. How they “get” the job of looking at a book critically. It was a cool lesson, an amazing day. And, best of all, it made me smile.